These baskets with the oddly attached handle have now been attributed to Matthew Turnbull (England). 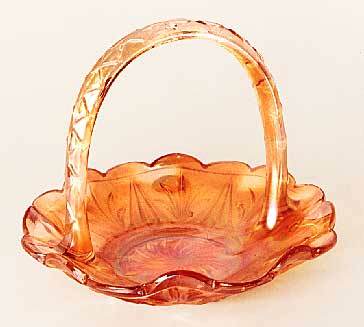 This is one of several similar designs with the handle attached in this way–all referred to as May Basket. 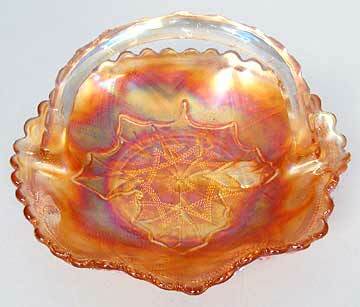 There are at least 5 variations in this shape. The basket above right has an outline of a Maple Leaf on the inside; a ski star type design on the outside base. It was 7 3/4 inches across. It sold for $35 at a 2009 auction. Photo courtesy of Remmen Auctions.